Well, I was going to show you the pair of seamless slippers I finished Sunday night but the lighting was terrible and I go to work in the dark and return in the dark. I knit this slipper at the end of October and finally got the mate done. Pretend there are two slippers here. I plan to make two more pair before Christmas. I’m using acrylic yarn (don’t judge) as that is what I have tons of and it really holds up well for these seamless slippers. It’s a bit hard on my hands and fingers. 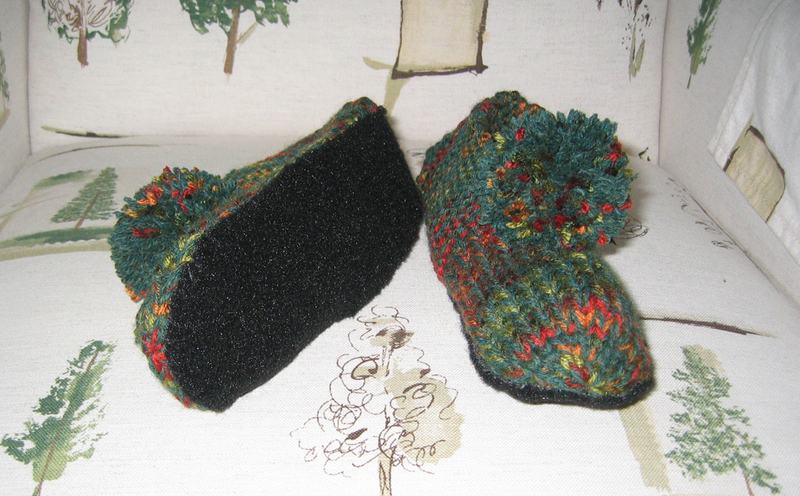 I will sew replacement carpet soles on these as well as add pompoms. 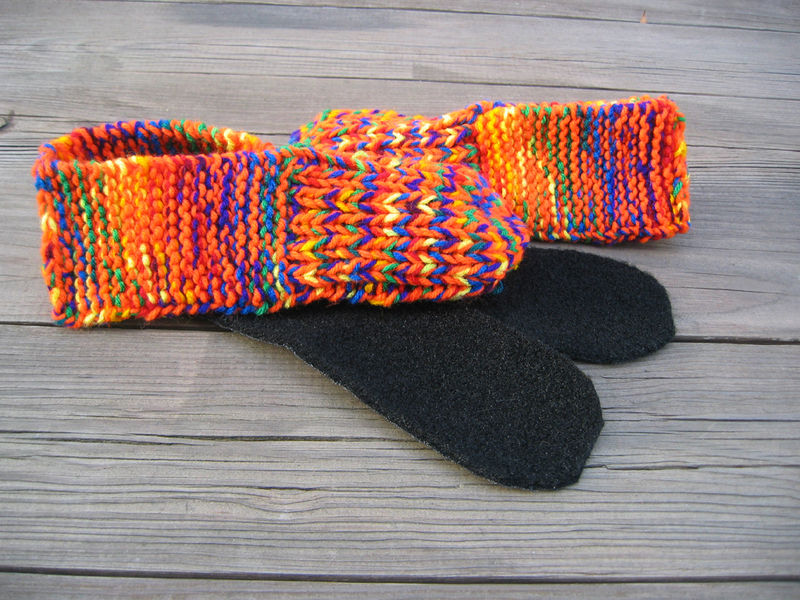 This entry was posted in finished object, knitting and tagged finished object, knitting, seamless slippers, slippers by Patti_is_knittinginflashes. Bookmark the permalink. They look great. I’m a novice knitter and am making a pair of garte stitch fingerless gloves but it’s thick wool and heavy going. They are supposed to be able to be completed in an evening! 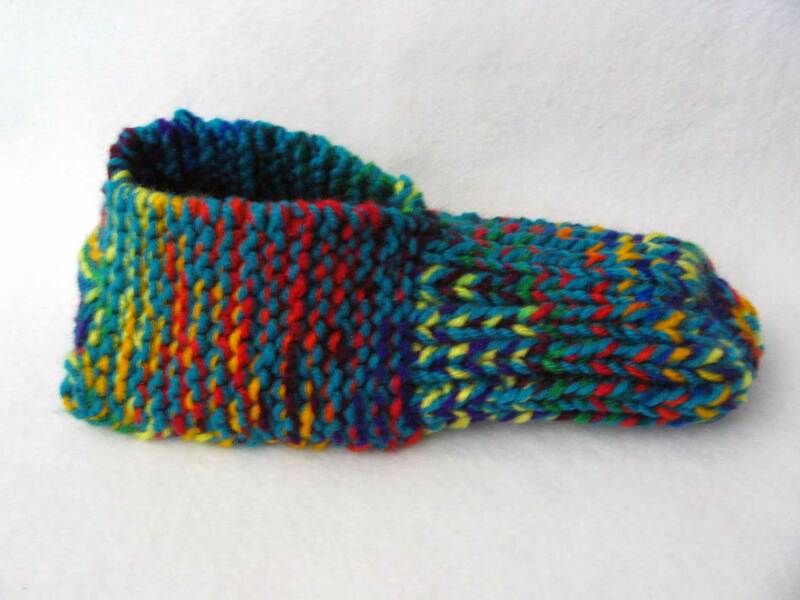 I really want to knit myself a pair of these kind of slippers but am failing to find a very easy pattern without too much increasing etc or knitting in the round. I have a similar, simpler pattern knitted flat using two regular knitting needles. No double pointed needles and no knitting-in-the-round. There are two seams to sew: one on the top of the foot and one at the heel. I’ll try to post it tomorrow. I love the ones you made for me. They have held up so well. I’m old enough to Name that Tune….Sound of Silence by Simon and Garfunkel. Yes and I had that song running through my mind all day. Oh, no! It’s back again. I like it but enough is enough! !